If you’re doing the literature review properly, you’ll be searching the relevant specialist bibliographic databases for your field. If you’re a fairly typical student, feeling lost and bewildered by discovering this new world of advanced assessment of a huge literature, then it’s quite possible that you’ve never heard of specialist bibliographic databases. 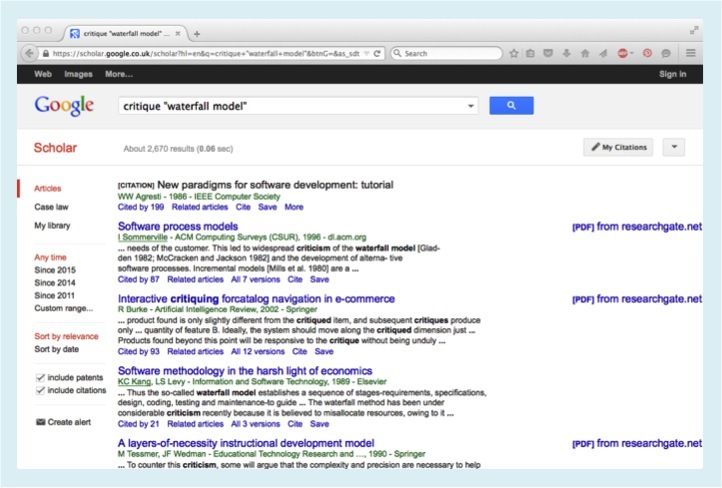 I’ll leave those to the side for the time being, and instead use Google Scholar as a familiar, friendly place to start. Let’s suppose that you’re doing a literature review about software build projects. You know about the waterfall model, where the project team gather the requirements at the start, then plan the project, and then build the software and show the completed product to the client for sign-off. You’ve never heard about any other models, and you don’t know the strengths and weaknesses of the waterfall model. 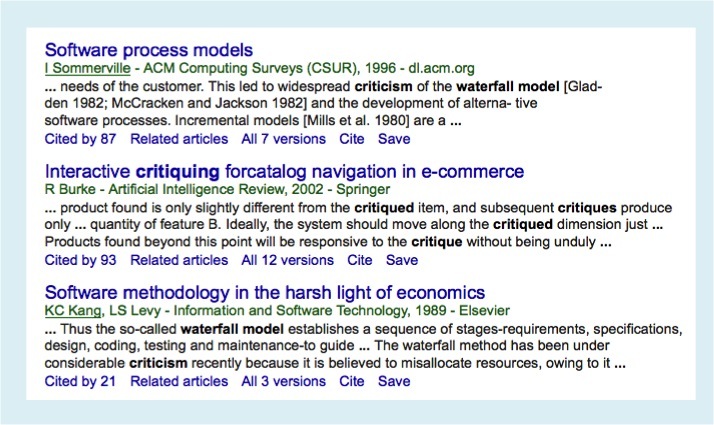 The method I’m describing today involves going onto Google Scholar, and typing in the word critique followed by the phrase “waterfall model” in inverted commas. The inverted commas are important, because otherwise you’ll get a lot of false positives (i.e. records that aren’t relevant, which were found because they include the word “model” somewhere or the word “waterfall” somewhere but which aren’t about the waterfall model). What you get from that search will look something like this. Here’s a close-up of the relevant part. This is the first page of results from your search, and already you’ve found articles that describe problems with the waterfall model. If you’re going to do a software build, then you need to know what those problems were, and what the alternative approaches might be. The Sommerville article and the Kang & Levy article both describe widespread criticisms of the waterfall model, and the Somerville article explicitly mentions other, different, software development methods that were likely to avoid those problems. That’s a pretty good start. You already have two articles that you can read and cite in your literature review, which are both critical of the waterfall model. These articles showing the person reading your literature review that you’re going out and finding relevant critical literature on your own. If you’re of a cynical nature, you might have noticed that both those articles are from the 1980s, and you might be wondering if that’s a problem. If you’re of a cynical nature, you might be pleased to learn that it isn’t necessarily a problem. If you’re cynical and lazy, you can simply write in your literature review something along the lines of: “The limitations of the waterfall model were identified as early as the 1980s” and then move swiftly on. If you’re more conscientious (and also more careful about whether those old problems might have been fixed by now) then you’ll be well advised to look for some more modern articles, to see what the situation is now. Where do you go next? One sensible next step is to start a list of the other methods that are being mentioned, and to repeat the same type of search, only with the word critique combined with the name of each other method. That will give you a quick and dirty overview of the main issues relating to software build methods. There’s still a lot more work to do before your literature review is finished, but this approach will give you a fast overview of the key points, so that you’re not drowning in a huge sea of detail. Once you have that overview of the key points, you should know the main arguments in the field being covered, which makes it much easier for you to start critically reviewing the strengths and weaknesses of those arguments in your literature review. One quick practical point before I close. You might be wondering why I’ve recommended the word critique rather than more familiar plain English terms like criticism. There’s a reason for this. So, that’s one way of approaching a critical literature review. I’ll blog about others in later articles. This entry was posted in craft skills, education theory, hints and tips, research methods, useful concepts and tagged critical review, literature reviews by hydeandrugg. Bookmark the permalink.